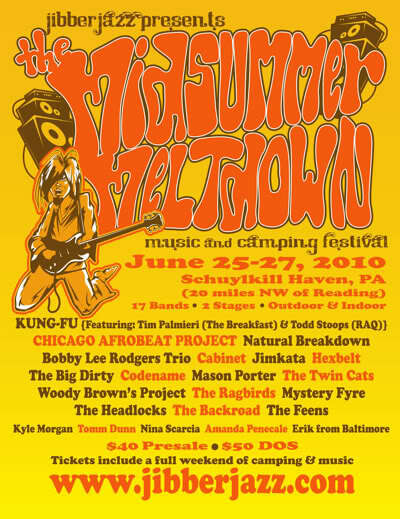 JIBBERJAZZ LAUNCHES JUNE FESTIVAL: The Midsummer Meltown! Join us for a weekend of camping and music in a hassle-free, BYOB environment. Our new venue is a beautiful 60 acre property outside Schuylkill Haven, PA. The site features plenty of room for camping, permanent restrooms & showers, indoor & outdoor stages, nature trails, PA approved trout fishing waters, and electricity access for RV's. As always, a wide array of musical styles will be featured including: Jam, Funk, Folk, Bluegrass, Blues, Rock & Roll, Reggae, Americana and more…………..